Navy Pier, Cloud Gate, Barack Obama, Oprah Winfrey, Italian beef, Chicago dogsâ€”these are all things the Windy City is known for. 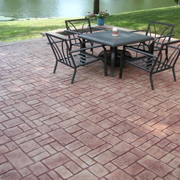 However, you probably didn't know that Chicago is also one of the leading markets for stamped concrete. By adding texture and color to concrete, contractors can recreate the look of stone, brick, wood and other materials. Because concrete is so versatile, you can have virtually any look at an affordable price. It is a great option whether you are looking for a new patio, pool deck, driveway or walkway or hoping to spruce up existing exterior surfaces. Many homeowners in the Chicago area have already discovered the benefits of stamped concrete. Check out the pictures below to see why stamped concrete is so popular. Here is a list of concrete contractors in Chicago.. This project, installed by Concrete Coatings of Illinois in Crest Hill, has a very classy look. There are a variety of stamped concrete patterns to choose from, this one is an ashlar slate, which is very popular in and around Chicago. Ashlar slate stamped concrete closely replicates the look of cut stone, but at a fraction of the price and it can be installed in much less time. This pattern looks great with many styles of architecture, especially traditional homes. When picking a pattern for your stamped concrete, consider the style of your home and what compliments it well. Your contractor will be able to assist with the selection process. 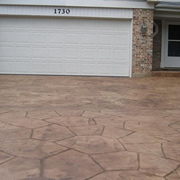 Many people love the range of colors that stamped concrete offers. This patio from G-Cat Construction Company in Bartlett was colored to look like red clay pavers. The most popular colors for stamped concrete are earth tones such as browns and tans, but of course the color can be customized exactly to your liking. Many stamped concrete contractors will use multiple coloring methods to get the most authentic appearance. The concrete mix itself is often colored integrally and then topical color is added in the form of a hardener or stain. 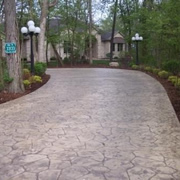 Another random stone driveway, this example from SWC Concrete in Schaumburg shows how realistic stamped concrete can appear. In fact, if you took a drive through the suburbs of Chicago you'd probably have to look twice to tell the difference between a driveway like this and one paved with natural stone. However, if you select stamped concrete for your home, you'll soon discover there are differences, especially when it comes to maintenance. Stamped concrete is very low maintenance, simply hose off dirt and debris and reseal the surface every few years. 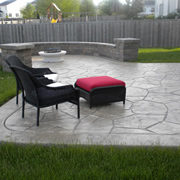 Stamped concrete is the perfect paving material for outdoor living spaces. Here, Varela's Concrete LLC in Plainfield created a patio designed for outdoor entertaining. Close to the house there's plenty of room for a dining table, chairs and a grill, while further out an area has been specifically created for a fire pit. After installing a stamped patio like this, you'll be amazed at how many complements you get when inviting friends and family over for a barbecue. Clearly there is no shortage of good stamped concrete work in the Chicago area. If you still haven't made your decision contact a few local contractors and ask to see some of the past work in person. You may also want to discuss how to prevent your new stamped concrete from cracking in freeze thaw conditions since Chicago has chilly winters. There are a variety of additions that can be made to the concrete mix before pouring to prevent this problem.